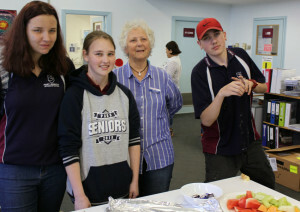 A Thanksgiving Afternoon Tea recognising contributors in the school community was held in the YES Centre on Tuesday, November 13. The afternoon tea was organised by Pastoral Support Worker (school chaplain), Margi Fiegert, through Schools Ministry Group (SMG). Margi acknowledged the support of members of St Augustine’s Anglican Church who made an assortment of foods for the afternoon tea. She said the aim of the afternoon tea was to give thanks for principals, teachers, SSOs, chaplains, administrative staff, and all who work within the school. The occasion was also to pay tribute to carers, volunteers, governing council, friends and organisational partnerships that work towards the success of the school. Students read messages of thanks before the afternoon tea was shared. SMG chaplains offer support in the areas of role modelling and mentoring, social and emotional support, spiritual support, school engagement, community engagement and extra-curricular contribution.